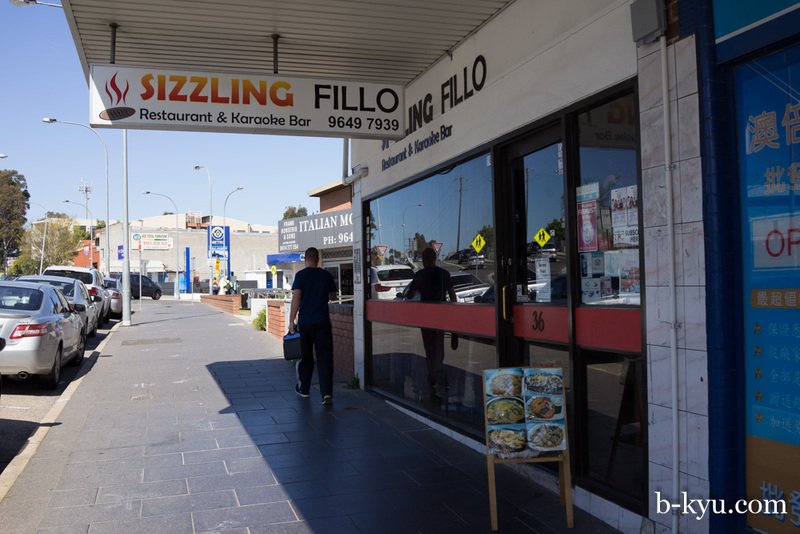 A few years ago we walked past Sizzling Fillo and thought 'nah, too fancy for us'. How wrong (and stupid) were we? 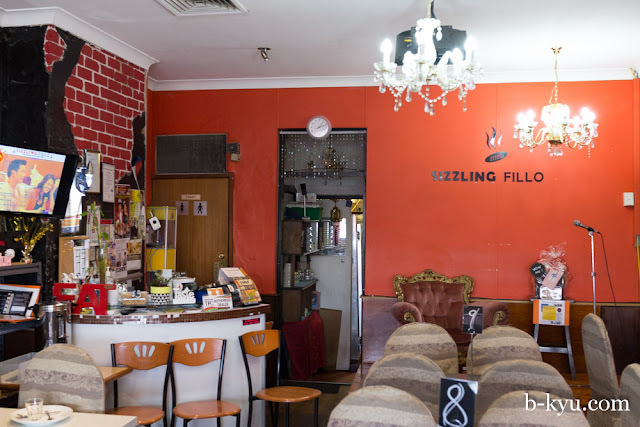 Finally we step inside to discover Sizzling Filo's decor is beautifully b-kyu, like your classic hole-in-the-wall restaurant crossed with a reception centre, plus a grand karaoke throne as a centrepiece. We love the cloth and bow wedding chairs, which look a lot fancier from across the street. We love the authentic faux chandeliers and the mirror frames with Venetian masks hanging from the centre. And what's with that exposed redbrick splashed with jet black paint wall design? We're not sure, but we love it. It's a Filipino restaurant so of course the staff are wonderful. And so are the customters. Folks dine in big happy family groups, the place has a great vibe at weekend lunchtimes, we can imagine a real party atmosphere on weekend evenings, especially on Boodle Fight nights, where a mountain of food is served on banana leaves down the middle of the table and folks dive in with their hands. That's our kind of fight club. Lechon kawali - crispy fried rack of pork with a side of liver sauce - $13. This small but naughty serve of lardy crispy skinned pork worked wonders with the light and healthy siningang soup. If the words 'liver sauce' frighten you then don't worry, it's not super funky and it's served safely on the side. On our second visit we felt like giving our arteries the punishment they deserve with the house specialty, crispy pata - deep fried crispy pork hock with crushed garlic and soy vinegar dip - $21. It takes a while to cook but it's worth the wait. There's a small amount of super juicy flesh but the star of the show is the crisp crunchy crackling, it's sensational and there's loads of it. It's a super lardy dish by nature but it's not super oily. 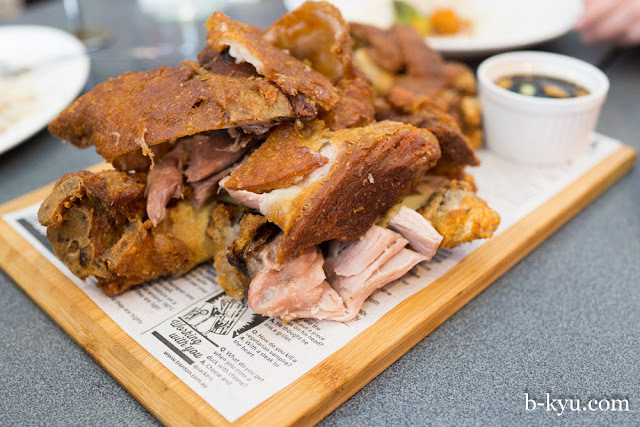 Crispy pata is not the kind of dish we usually order but we loved it, it's the must-try dish here. We ate piggy-loads of crispy pata yet still had enough leftover to fill takeaway container. 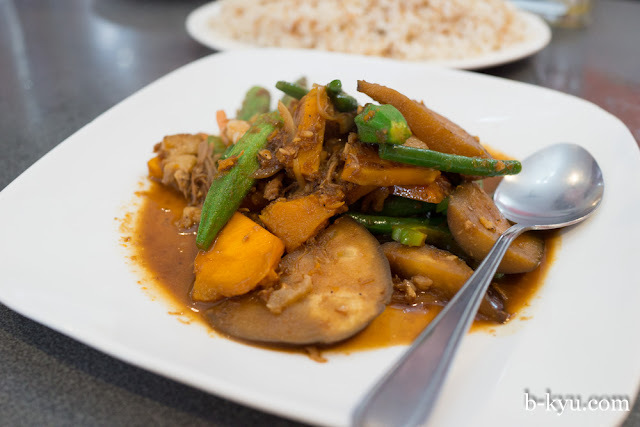 To balance out the medical evils of crispy pata we order a veggie dish - pinkabet - pumpkin, green beans, okra, eggpant and pork pieces sauteed in shrimp paste - $15. 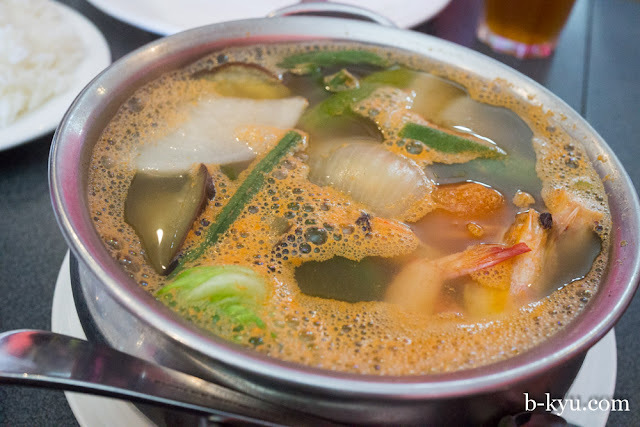 The shrimp paste and little pork pieces give a real oomph to a bunch of humble veggies. We could easily order this and just some garlic rice. 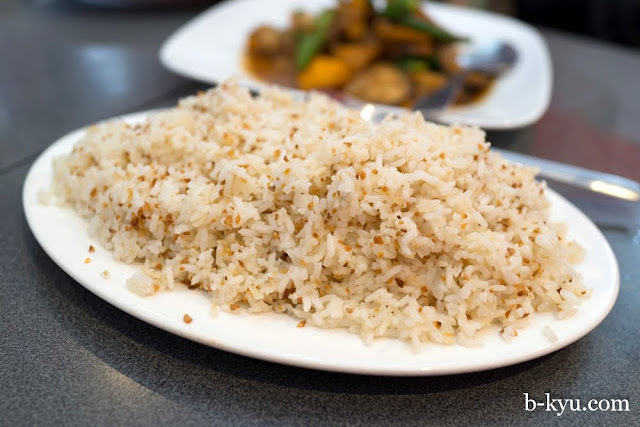 We try garlic fried rice - $6 (medium) just for a change to plain rice. This hearty rice good is enough to eat on it's own. The drinky-poos are popular and only $8.50 per jug, or $4 per glass. The iced tea (left) is sweet and lemony and much nicer than bottled lemon tea. 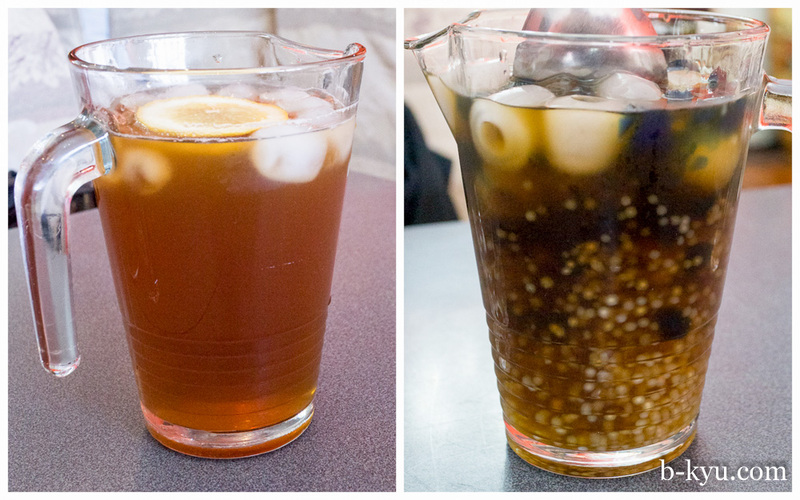 For more action-adventure try the sago't gulaman - tapioca pearls and gelatin with caramelised sugar, it's a bevvy and desert all in one. 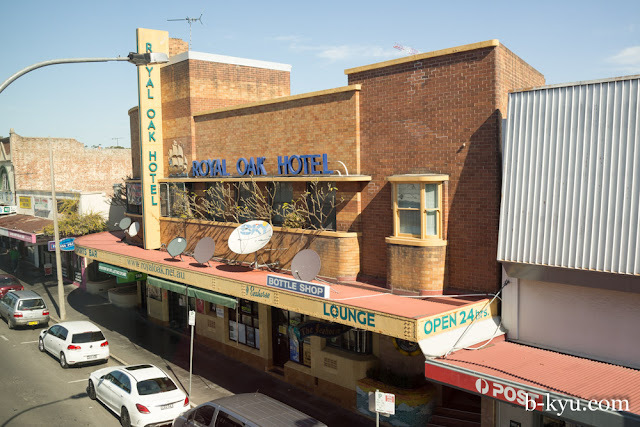 A few doors down from Sizzling Fillo is the glorious Royal Oak Hotel which features $4.50 schooners 24x7 and tops old blokes putting a fiver each way on race four at Doomben. If this isn't your cup of tea then just stand outside and marvel at the gorgeous signage for the Seahorse Bar, the retro nautical themes promise untold maritime adventures, lashings of rum, floozy mermaids, 30+ sunscreen and treasure chests. The reality is a fluorescent water feature in a pokie den. Close enough for us. Love this patch of Parramatta Road in Lidcombe, there something so Nowheresville, USA about it. This post was brought to you by a stumpy tail pussycat of Ashfield. The pussycats are so tough in Ashfield they headbutt you to get a pat. The Ashfield kiss we call it. I've been reading your blog since 2011 and have to say i find all you reviews very helpful. Especially as my wife, sprog and i always eat out due to the very convenient and diverse restos here in the inner west. As a filo i am also very impressed with your filo restaurant reviews and am so glad you are very honest with your findings. I also loved reading about your trip to the PH and that you guys weren't afraid of trying out the hole in the walls as well as jolliebee. Keep up the great reviews and look forward to more reviews. If you ever need some suggestion on filo grocery shops in the inner west ill be happy to point into the right direction. There are more than just the one in Mascot (though you can always get a bahn mi there at the same time). Btw theyre planning to open up a jolliebee here in australia. Thanks for your comment! Shawn will be lining up when Jollibee opens here. 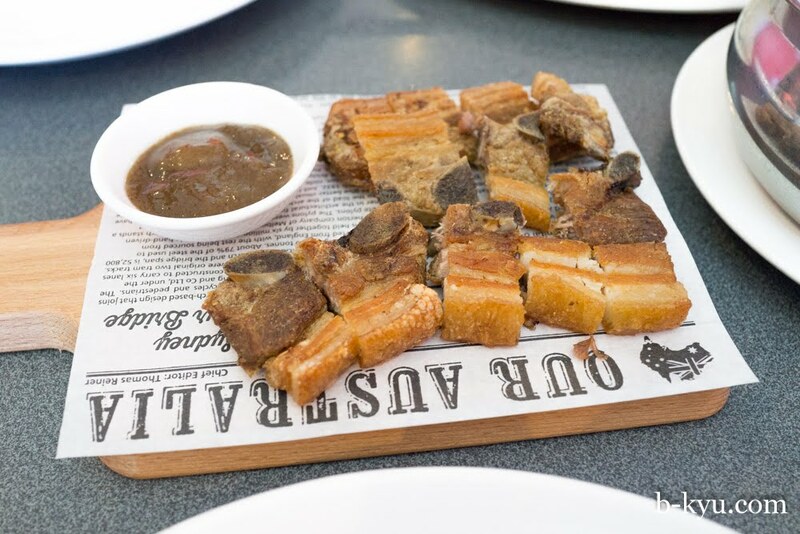 We really love Filipino food, it's underrated and under the radar (until of course someone opens a fancy shop in Surry Hills and all of a sudden it will be 'discovered'). Interested to know about other stores in Masoct and any other hints. 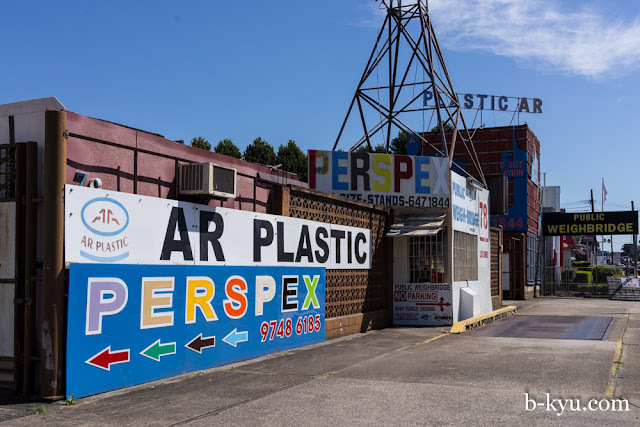 We have the one in West Ryde in our sights.